MagniLink Zip Desktop Video Magnifier - HD 17 control panel was designed according to the latest hi-tech standards while keeping client feedback in mind. It’s easy to find, learn, and maneuver - for example, the function knobs rotate and are simple to handle, easily seen, and there is an advance mode for advanced users. The 17 inch monitor has brightly colored screen edges, an anti-glare surface, provides crystal-clear sharpness, high contrast images, and a dimmer for light-sensitive users. The screen is easy to adjust by tilting it forward or backward and can also be modified for height. 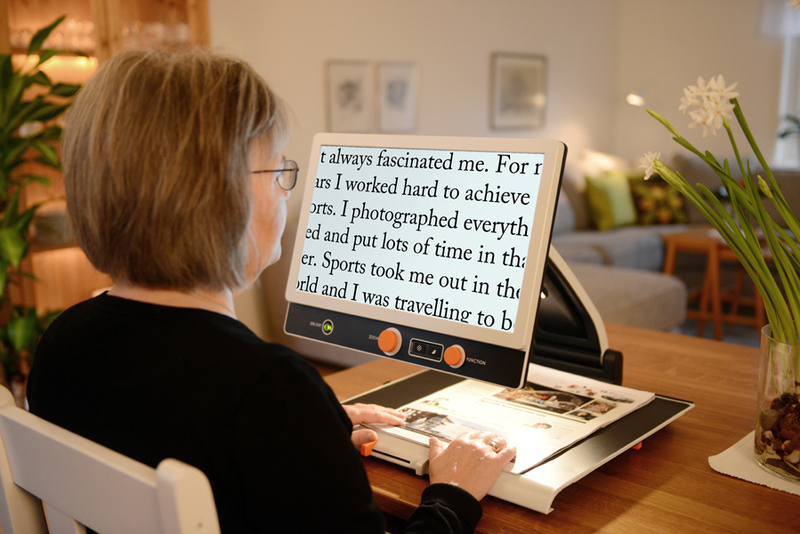 This model has with a low-vision adapted Hi-Definition screen and a High Definition (HD) reading/distance camera that rotates both vertically and horizontally. The resolution used in the HD camera is 720p (720 tv-lines) and it brings out the detail in every photo. The unit is easy to fold and unfold and can be carried to different locations. Its weight is less than 15 pounds and a protective, soft-shelled, zippered carrying case is included. When folded, it measures 17.3 x 18.5 x 4.7 inches. For convenience, a battery with a running time of 5 hours is included. The amount of run time depends on the light intensity chosen for the screen and lamp.